Have you ever thought of the cost you are putting into your yards in comparison with what you are getting out of them? Spring is the time we get out and start our landscaping projects. Are you making your dollar work the for you when it comes to landscaping. Advise is mixed as to whether or not curb appeal affects the price of a home much. The prevalent feeling is that low-maintenance, yet clean, landscaping is always a good choice. Chances are that if you have invested a lot into your landscaping, the new owners won’t be interested in it, so it won’t pay you back. My husband likes to tease me that we’ll just get rid of the grass in our front yard and save the gas money. This is actually a consideration in many parts of the country. For example, in Las Vegas, most city yards aren’t covered with grass. It simply isn’t water efficient. When looking at your yard, consider how much you will have to water it and how often you will have to mow it. For more yard and lawn tips, click here. If you are starting from scratch, look for slow growing grasses that are designed for your area. These grasses can cut your mowing time and may not need extra watering during the summer months. 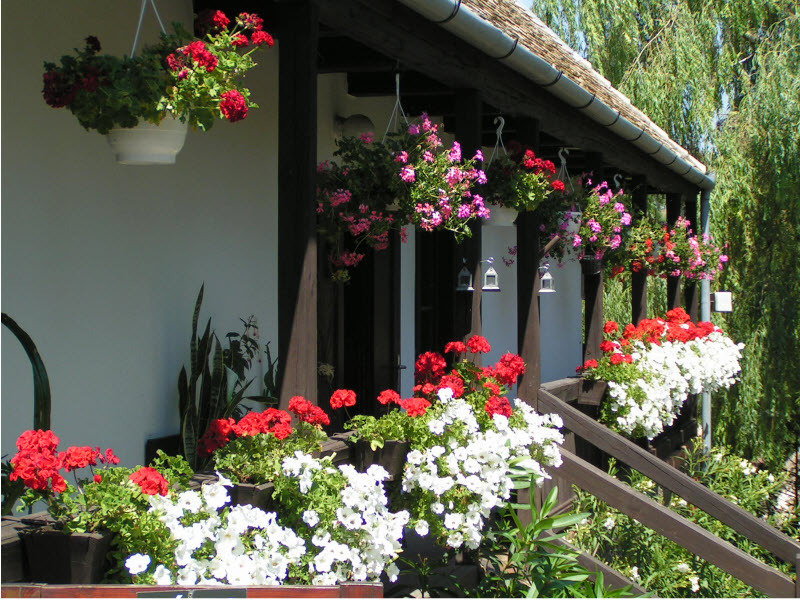 When it comes to the details, there are efficient ways to add color and design to your yard. Unless you love to work in the garden, annuals aren’t for you. If you have to have that punch of color, don’t go overboard. Just plant a few annuals (it’s cheaper if you do it from seed) in a high traffic area, such as by your front door. Perennials are the popular, low maintenance choice for most people. Look for plants that are native to your area. There are some plants out there that need little water and are very disease resistant. If you choose well, you should be able to plant and forget. Simply follow the directions for spacing, and you should have to do anything to your perennials for several years. You can even cut out weeding by using a landscaping carpet in your beds. Or for the frugal gardener, use those newspapers. Simply layer the newspapers around your plants and cover with mulch. No weeds and the newspaper breaks down into the dirt. Shrubs are a great way to add beauty to your garden without costing you a lot of time or money. Flowering shrubs can bring beauty to your garden without the yearly cost of annuals. Again, be sure you select plants well-suited to your area and the growing conditions around your home. Yes, occasionally you will need to prune your shrubs. But with shrubs and perennials, you watering, weeding and maintenance is reduced. Don’t forget to consider your family in your landscaping decisions. I’m not planting flowers in our new homes yard, because I have a feeling that they will be too tempting to our young daughter. Some well placed, and pretty, herbs and vegetables near the front door will add some blooms and are perfectly safe for my children. Plus, we’ll be able to eat them. Double-duty is always frugal.